For days now I’ve had a post about free photography courses and resources for homescholers almost ready to publish, but technical glitches are sadly keeping that one in draft mode. It’s been a bad week on my websites, the homeschooling one and all the others, so I thought today I’d tell you about the marine science and oceanography course my 12 year old is following at the moment. 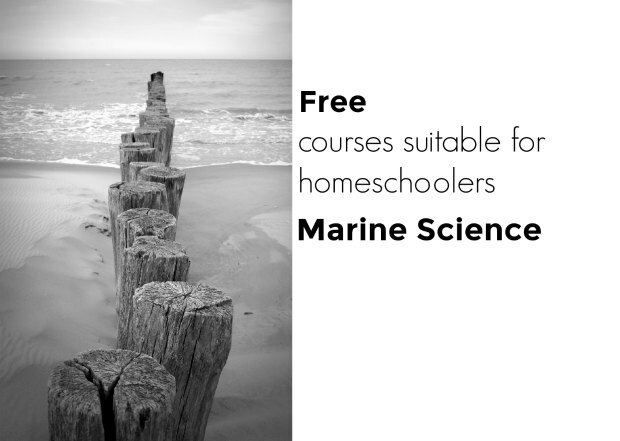 I found this free course while looking for a photography course for me, spotted that they had a big selection and asked him if he’d like to pick one, he chose the sea. His name means “son of the sea” after all. I was worried that it would be pitched at too high a level for him, it’s a website linked to the open university australia, but it’s been fantastic. Let me tell you a little about it. I’m not getting anything out of promoting them, I just thought it was cool and you should know about it. Free courses are always cool and the quality of this one is superb. I have a degree in Biological Sciences so I know my way around a lot of the content and I’ve been learning and following alongside my homeschooler. It is pitched at a high level, but my 12-year-old is coping just fine with it, enjoying it and learning loads. It’s self paced, so we can watch a couple of videos whenever we feel like it. The fact tat he understands it and it’s opening his eyes, is giving him a real confidence boost in his own abilities. Climate change is a big topic right now, with certain world leaders denying its existence, so it’s great that he’s learning hard facts that he’ll carry into the future. The course is made up of multiple short videos, so no one unit becomes long and boring. At the end of each video there is a multiple choice question to answer. There are many, many more topics. We are about half way through right now and both of us are looking forward to watching more units. As you can see from the above, a lot of topics are being covered quickly and he’s taking them all in his stride. Geography, biology, chemistry and physics are all represented in this course. It would look great on your homeschool report if, like I was, you’re unfortunate enough to have to write one. So, don’t be put off by that word “university” take a look at one of these courses, there’s a huge selection and you’re sure to find something to suit your family’s interests. I’m putting this website alongside Khan Academy as a favourite, brilliant, useful, free resource for my older homeschoolers. My primary aged son isn’t ready for this yet, but my 12-year-old high school age child is lapping it up and so am I. Now, back to wrestling with websites, have a great weekend! I love the free course suggestions! I may be delving into these for my son’s summer curriculum since we will be finishing his homeschool Acellus.com curriculum by April. I’d signed up for the homeschool option when if I’d selected the tutoring option he could’ve finished sooner. Oh well. We’ve just started the Chemistry course with Open 2 Learn, Nita, it’s superb! We’ve done at least a year of high school chemistry in the last hour and it’s so well explained!